Over the last decade and a half, the Southwest has experienced significant drought conditions. These conditions can lead to changes in our state's water supply availability. Fortunately, Arizona has developed a diverse portfolio of water supplies and management strategies which serve as the foundation of our State's robust water system. This diversity allows Arizona to more effectively manage water resources, allows the state to subsist with the effects of existing drought conditions and provides more options in planning for our states future economic growth. Surface water from lakes, rivers and streams is Arizona's major renewable resource. Because of our desert climate, the amount of surface water available can vary from year to year, season to season, and place to place. In order to make the best use of the surface water when and where it is needed, storage reservoirs and delivery systems have been constructed throughout the state. Most notable are the major reservoir storage systems located on the Salt, Verde, Gila and Agua Fria Rivers. The Colorado River is Arizona’s largest renewable water supply. Arizona has the right to use 2.8 million acre feet annually of Colorado River water. Mohave, La Paz and Yuma county water users rely on Colorado River as their principal water supply. When fully utilized, the Central Arizona Project will deliver on average 1.5 million-acre feet of Colorado River water to Maricopa, Pinal and Pima Counties. Groundwater is found beneath the earth's surface in natural reservoirs called aquifers. In most cases the water stored in these reservoirs has been in place for millions of years. In 1980 Arizona passed the Groundwater Management Act which protects water users and reduces the State’s reliance on the use of unsustainable groundwater supplies in the State's most heavily populated areas. Reclaimed water is treated to a quality that can be used for purposes such as agriculture, golf courses, parks, industrial cooling, or maintenance of wildlife areas. As Arizona’s population grows more treated wastewater will become available. How much water do we use and how do we use it? In 2017, Arizona’s total statewide water use was approximately 7 million acre-feet. Arizona’s water use can be divided into three categories: municipal, industrial and agricultural use. 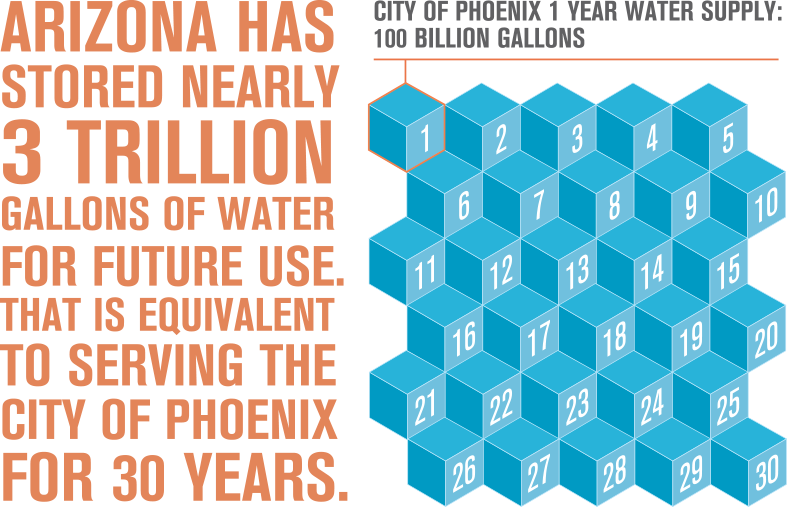 Arizona’s population has grown steadily over the years, however through significant investments in water conservation and infrastructure and the reuse of water, our water use is essentially the same as it was more than half a century ago. The majority of water users in the state are under mandatory water conservation requirements 365 days a year. 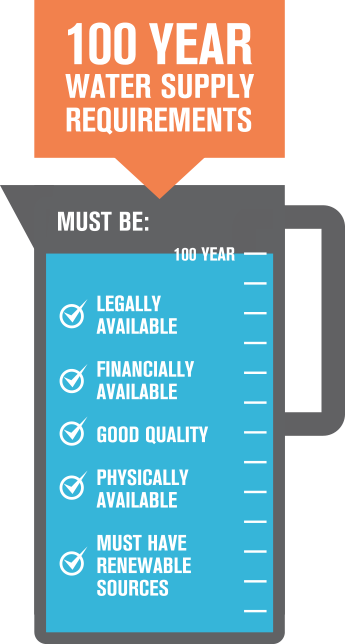 Large municipal water providers with a designation of assured water supply participate in the Gallons Per Capita Per Day (GPCD) program or the Modified Non-Per Capita Conservation Program (Modified NPCCP). Large municipal water providers without a designation of assured water supply must participate in the Modified NPCCP. Large municipal provider distribution system losses are not to exceed 10% annually. Allotment-based requirements for large turf facilities, dairies and feedlots. Best management practices or design limitations are required of mines, cooling towers, sand and gravel operations, large scale power plants and new large landscape users. No new agricultural acreage in production. Each farm (Irrigation Grandfathered Right) is assigned a maximum annual groundwater allotment, based on assumed irrigation efficiencies of 65 to 80%. Certain farms have enrolled in an optional best management practices program. Irrigation district distribution system losses are not to exceed 10%. Within most urban areas of the state a 100-year water supply must be proven before land can be developed. Arizona’s innovative water management programs and collaborative long-term planning has allowed for water providers and private entities to store trillions of gallons of water underground to be used in the future.